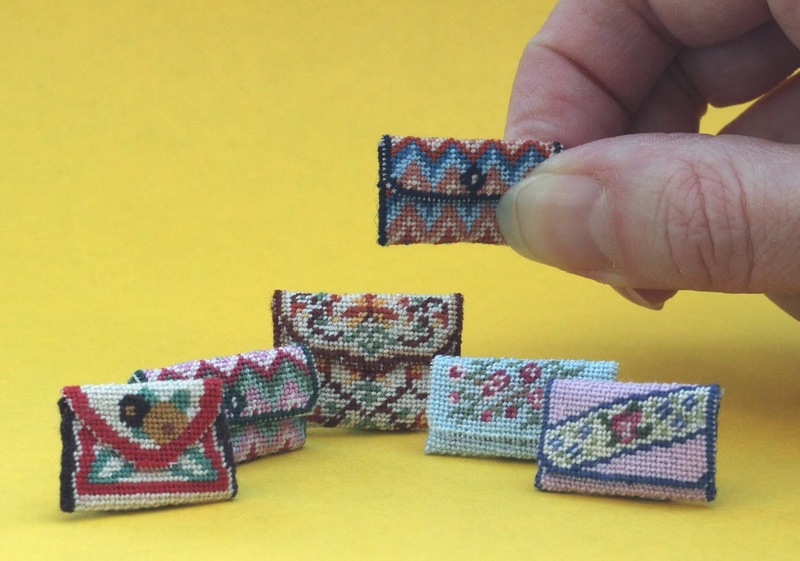 Artisans in Miniature: Tiny little clutch bag kits for doll’s house dolls! Tiny little clutch bag kits for doll’s house dolls! Do the dolls in your doll’s house have a handbag obsession?! Does your doll’s house need that ‘lived in’ look that can be created by placing personal belongings in the rooms? These little clutch bags could be just what you’re looking for. Janet Granger has just launched these cute little kits for you to make - they are quick to stitch, and easy to assemble. With six patterns to choose from, there is bound to be a suitable design for you to make, so that the dolls in your doll’s house have just the right bag for any occasion. The clutch bags are all to be stitched using tent stitch (like half cross stitch) on 40 count silk gauze. The kits contain Anchor stranded cotton, a generous piece of silk gauze, clear instructions, a suitable needle and a colour block chart to count the design from. www.janetgranger.co.uk/tutorials.htm and see how easy it is to create one of these little clutch bags. The kits cost £9.95 each. P&P is £1.75 per order if placed by post (cheques to Janet Granger); p&p is free online if your order is over £40, otherwise it is £1.75.